Home / Uncategorized / YL Members About to Go Inactive? 3 Easy Steps to Reconnect! Have you seen our “We’ve Missed You” card sets? They are an effective tool for reaching out members who are about to go inactive. Perhaps you welcomed them onto your team and have offered education and support, but gotten little response. Maybe they don’t know that their membership only stays active if they order at least once a year? Before they go inactive, or if they already have, send them a note to help get them back on track toward wellness, purpose, and abundance. The process is simple, especially if you are familiar with Virtual Office. Navigate to our site and pick up a set of We’ve Missed You cards. These are affordably priced and inexpensive to mail. USPS First Class Mail for postcards runs about 35 cents per card. Shipped nationally, the postal service will deliver First Class Mail in 1 to 3 business days. Use these cards to provide members a reminder message about their account status, as well as their member number and enrolled/sponsor IDs. It will make placing an order easier! Scroll down to the My Organization section and click View just under About to Go Inactive, the report will display a list of idle downline members. Click the Print Labels link located at the upper right corner of the report; select the desired label template for the addressee labels you will apply to the cards. Now that you have your address labels and cards ready to go, you can pen your message. Stick your address labels and postage on each card and let the postal service handle the rest. It’s a good idea to confirm that you have We’ve Missed You cards on hand prior to the end of the month. You want to allow time for mail delivery and for your member to take action to prevent their inactivity. Revisit the VO in a few days to see your progress. Some people find it helpful to follow up with their team members with a phone call or to offer a promotion through Project Broadcast, email, or Facebook message! 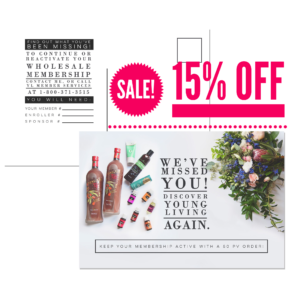 It makes the conversation easier because your member has their Member ID and the Enroller/Sponsor IDs on hand when contacting Young Living to reactivate on your team!